People walking around your apartment and your walls and banging and smashing in walls and floors day and night. And State of Sweden using their sound technology to targetting your mind. Neighbor 1. Walking around and organized gang stalking 24/7 from morning to late night, and even wakening you up in the middle of the night by dropping heavy things on the floor above your head at night and then laughing loud about it. These people above my apartment harassing 18 hours every day. Making hitting sounds in the floor, drilling in walls, hammering in walls and floors, dropping heavy things on the floor, stamping, stomping or walking heavy on the floor, starts constantlu fake coughing for 15 minutes in every breath and starts this every day, and then starts following you around your apartment with this fake coughing every time you make a breakfast, or eats dinner, then they door slamming from morning to late night, and every time you make your dinner, they sitting above your head and dropping things on the floor when you watch tv-series and movies and in same second something happening in the movie or tv serie they drop something above your head in real time presence, and evrytime time you write a mail to some department inb Sweden, or social services, or using your Internet bank these neighbors starts make hitting sound in the floor, when you calling they start make interfering sounds. And these people harassing 18 hours every day and several of times every hour, so they can do other things for more than 15 minutes and then starts some form of harassment. Morning can start with some hitting sounds for a few seconds here and there. 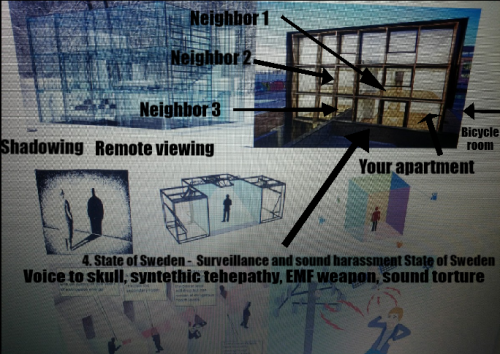 Organized Gang Stalking in Sweden is satanic, demonic, sadistic and robotic and these swedish organized gang stalkers working day and night, in same Satan working day and night and stalking. Organized Gang Stalking in Sweden is a Satanic Mind Control Program to destroy, drive targeted inidviduals to madness or to suicide. 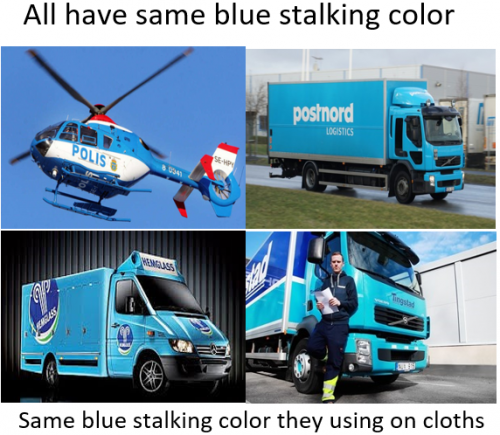 It´s like a reptilian hunting agenda worse than Nazi-Hitler, beacuse this stalking and harassment going on day and night, indoors and outdoors. And this symbolize a Satanic stalking.